FTS: Beyond Our Limits: SDSU’s LARGEST Asian Pacific Islander showcase, APSA’s 23rd Annual FTS: Beyond Our Limits will held Friday, April 19th, from 4:30-10 PM in Montezuma Hall! Featuring performances by Jules Aurora, Kevin and Dea Nguyen, and other Asian Pacific Islander talents! Make sure to RSVP here! SIGN UP FORMS: Sign up forms have been added for FTS: Beyond Our Limits RSVP! MOW AKA Member of the Week? MOW Archive? How do you become MOW? Who is it gonna be? Could it be you next??? Click above to find out more! 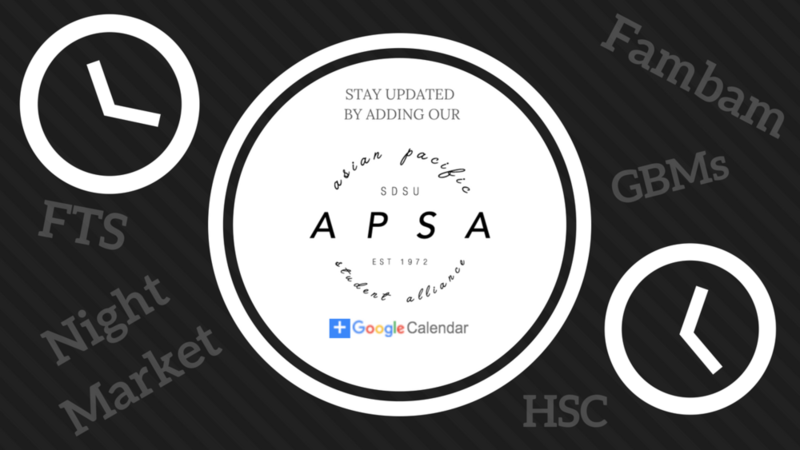 Stay up to date on events, auxiliaries, MOW, and all of APSA. Check your updates tab! Make new friends, bond with "siblings", and compete for the prestigious Fam Trophy. On all the things that unify our API cultures and identities. On all the issues that affect the Asian-Pacific Islander community. Everyone in APSA has a story. Read some of the inspiring, humbling, and powerful stories our members share. and stay up to date by joining our Facebook Group! Thank you for your message! We’ll try to get back to you as soon as possible.